We are a leading Manufacturer of lm bearing two row from Chennai, India. The BWU series is manufactured by Iko Nippon Thompson, and is a high rigidity precision ball slide which has a compact linear motion rolling guide appropriate for few stroke length. It is integrated with two rows of steel balls in four point contact with the raceways. Each of the components are made of stainless steel to give superior corrosion and heat resistance. series is manufactured by Iko Nippon Thompson, and is a high rigidity precision ball slide which has a compact linear motion rolling guide appropriate for few stroke length. 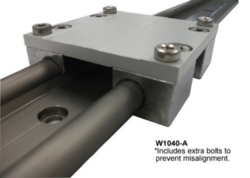 It is integrated with two rows of steel balls in four point contact with the raceways. Each of the components are made of stainless steel to give superior corrosion and heat resistance. Looking for LM Bearing Two Row ?